We install new seamless rain gutters on homes and other buildings. With our new gutter installation service you can expect a high level of quality in workmanship. Additionally our materials and customer service are great as well. When you call we start by coming over for a gutter price quote. After you agree to the service we begin. The steps below outline a series of events you can expect. 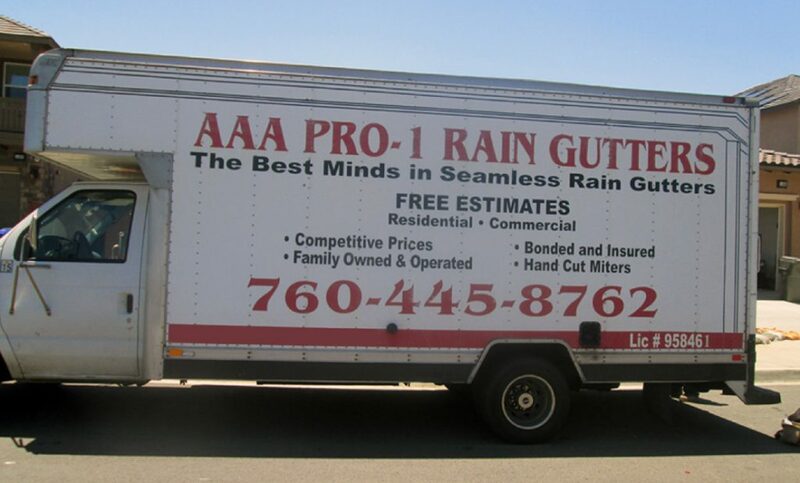 To start your new gutter installation service project, we first consult with you to determine the best rain gutters materials to use and set the overall project expectations. Determine the best way to install the rain guttering system on your home. And make sure it will be channeling water away from your home. Measure the edges of the roof line. This will help us determine the amount of guttering material that you will need. Combine the plan for the gutter layout and the roof measurement. Then calculate the components needed in the guttering installation. This will help us determine different components like elbows, end pieces, corners, downspouts and drop outlets to complete the installation. Using this information we set a price. And then we review the price quote with you. After an agreement is made we schedule the installation for a convenient near future date. On the right date and time our crew arrives ready to work. First we measure to make sure the gutters have the proper decline so the water flows down them properly. We calculate slopes to determine the flow of the water going to the down spout. Then we measure starting from the first mark going to the end of the downspout. Placing a chalk line on the end of the downspout serves as the line of reference for guttering installation slope decline. Next we install all the components for your rain gutter mounting brackets, corners, drop outlets and down spouts. Then we Install the seamless sections of the gutters to mounting brackets. Cut and miter the gutter sections where necessary. Install the elbows onto the downspouts. Then lastly is to attach firmly the downspouts on the sides of the house or other secure areas as predetermined. If necessary we run extra downspout pipe with special ends to route water away from structure. After installation is compete we walk with you as you review the finished work. Feel free to speak candidly of any concerns that might come to mind. Because we want to do everything we can to make sure you are happy with our work. Since we always do our best to make sure our clients are absolutely ecstatic about their purchase you’ll enjoy a high level of customer service. So we’ll take care of issues on the spot. If more materials or daylight is needed then we will schedule a convenient time on another day to complete the revisions. After you are totally satisfied then we complete the invoice and shake hands saying good day until we are needed again. For service with a smile (like the good ‘ole days) call Greg Martin at 760-445-8762. We’ll start with a free on site evaluation and price quote. And then go from there as you wish.